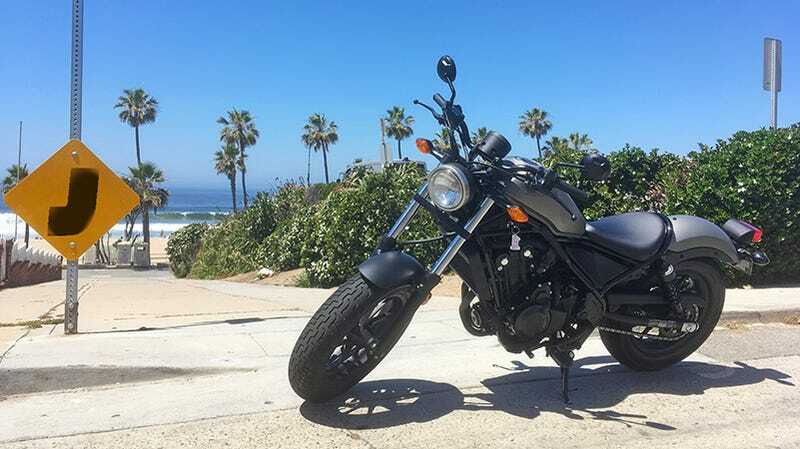 What Do You Want To Know About The 2017 Honda Rebel? Don’t call the Honda Rebel a cruiser, but it’s definitely not a firm-upright Universal Japanese Motorcycle either. And it’s obviously no sport bike, but the 471cc engine below the seat has some bite to it. I’m riding this “ultimate everyperson” machine all week, so let me know what you’d like a closer look at. I will say the 10-mile trip from Honda’s headquarters in Torrance, California to Jalopnik’s West Coast Bureau office in LA (my apartment) was not enough to find any significant faults. But it’s easy to have a sunny outlook on life with two wheels on the Pacific Coast Highway. My initial impressions are that the Rebel feels low, smooth, reasonably responsive and relatively light, if a bit top-heavy. I’ve already been enjoying the shifter, which bangs off gears with a satisfyingly decisive CA-CHINK every time. The machine’s also relatively compact. It hardly took me any time to get comfortable with the Rebel’s footprint, and I reckon I’ll be splitting lanes in no time. So far the only thing that’s made me mad is the placement of the horn and blinker buttons, which are flipped from my regular ride, which means I’ve been announcing lane changes with a squawk instead of a blink. The Rebel fits right in with a Triumph and a Harley. At $6,000, the Rebel seems like a cool crossover between a few genres of motorcycle that’s easy to ride without feeling lame. It’ll take me a few more miles to form a complete opinion on this bike, but while I rack those up, leave your burning questions about it here and I’ll keep them in mind while I carry out the shakedown.